Apparently, occasional “single-mother” Michelle Obama views the job of being married to the president ball-and-chain-like. The woman who drapes herself in haute couture (a far cry from prison garb), regularly parties with the glitterati, and gorges herself on $100-a-pound Wagyu beef feels confined? And she says this after spending $4,000 per-night on a hotel room in Dublin, Ireland right before going on a $100-million African getaway? Maybe Michelle should have mentioned that after unpacking and repacking back in her cell at the White House she’ll be sequestered in smaller prison quarters for extended summer punishment in Martha’s Vineyard. One has to wonder whether Michelle Obama has ever visited the women’s courtyard at San Quentin. When Michelle said living in the White House has some “prison-like elements,” shameless liberal shill Cokie Roberts tried to temper the ungrateful-sounding statement by saying that Martha Washington, the wife of George, who Barack Obama recently compared to Nelson Mandela, also described living in the White House as similar to being a state prisoner. The difference is that Martha didn’t spend $10 million in her husband’s first term jet setting around the globe at the taxpayers’ expense. After disengaging her rather large foot from her mouth, Obama said she valued her role as first lady, which she described as being emancipating in some ways, but restricting in other ways. So butlers, personal assistants, flying in Chris Sommers from Chicago’s Pi restaurant to make pizza, and six-to-eight vacations a year is liberating, but Easter egg rolls, hula hooping, being fitted for $6,000 gowns, being photographed by Vogue, handing out Academy Awards, and entertaining Paul McCartney and Beyoncé restricts her royal ‘Piece of the Pie’-ness? 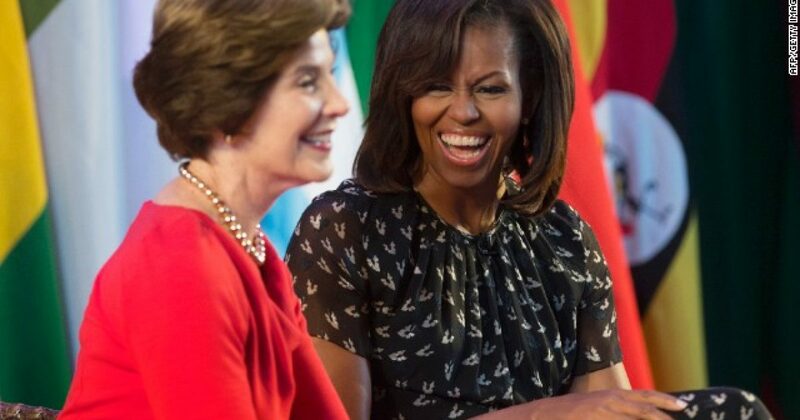 Always the diplomat, former first lady Laura Bush jumped in to remind the audience who, lest we forget, was attending the summit in poverty-stricken Tanzania, that first ladies had a chef to cream their “Let’s Move”-approved spinach sans the high-calorie cream. After crabbing about her life, Michelle clarified when she said “You can’t complain, but there is [sic] definitely elements that are confining.” Yeah, confining like the Spanx under your Jason Wu!